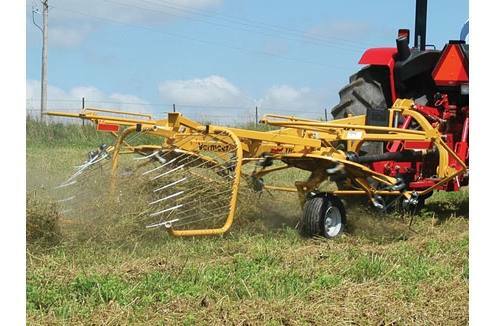 The Rebel TR90 Tedder is a compact tedder/rake combination made for small operations or part-time farmers. Easy to operate, easy to set up. Select from one of five settings on the rotor wheels to change the spreading angle or tedding height. To switch from tedding to windrowing, just adjust each tine and fold down the raking baskets. Achieve a uniform windrow thanks to spring steel tines outfitted with nylon tips. Maneuver easily around your property because the Rebel TR90's 3-point Mounting System allows quick, tight turns. 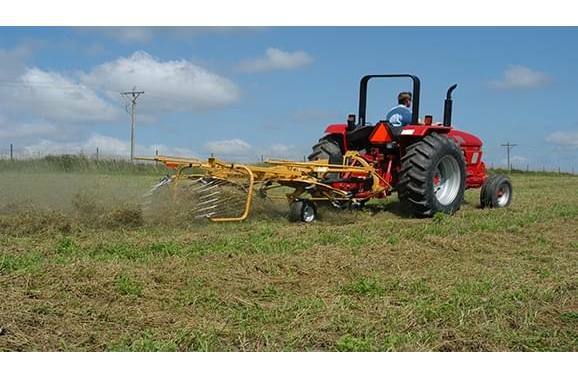 Take it to the next field by rotating and locking the headstock directly behind the tractor for narrow transport width.